Congrats Mara! I emailed you about your prize. Thank you everyone who entered, I loved reading all the wonderful traditions y'all have! I'd share pictures of the sketch, but I don't want to give away the surprise. Tonight I am hoping to sketch out/organize my ideas for the other challenges. I know I'll only have to do them if I move on past the nautical challenge, but it doesn't hurt to be prepared. So since I don't have anything else to share I'll leave you with a picture of my lovely handwork I've been doing recently. I love having a cross-stitch to work on in the evenings. 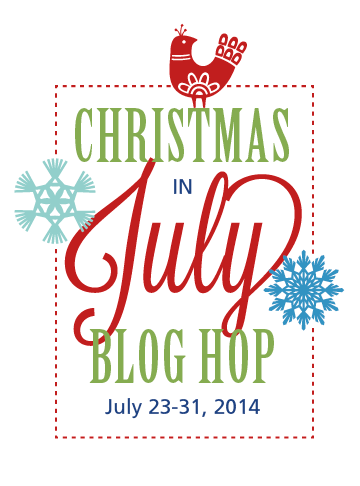 Today I am happy to be a part of Gina Martin's Christmas in July Blog Hop! 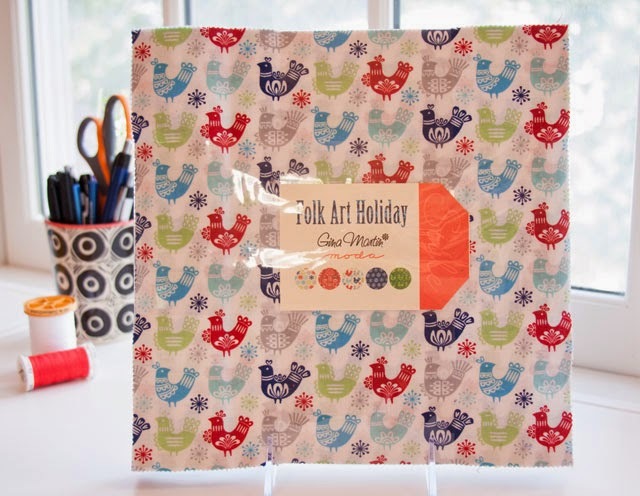 Gina has a new Christmas line out called Folk Art Holiday and it is absolutely gorgeous. Just look at how pretty this pile of selvages is! Here is the line-up of amazing bloggers that will be sharing their lovely creations during the blog hop. 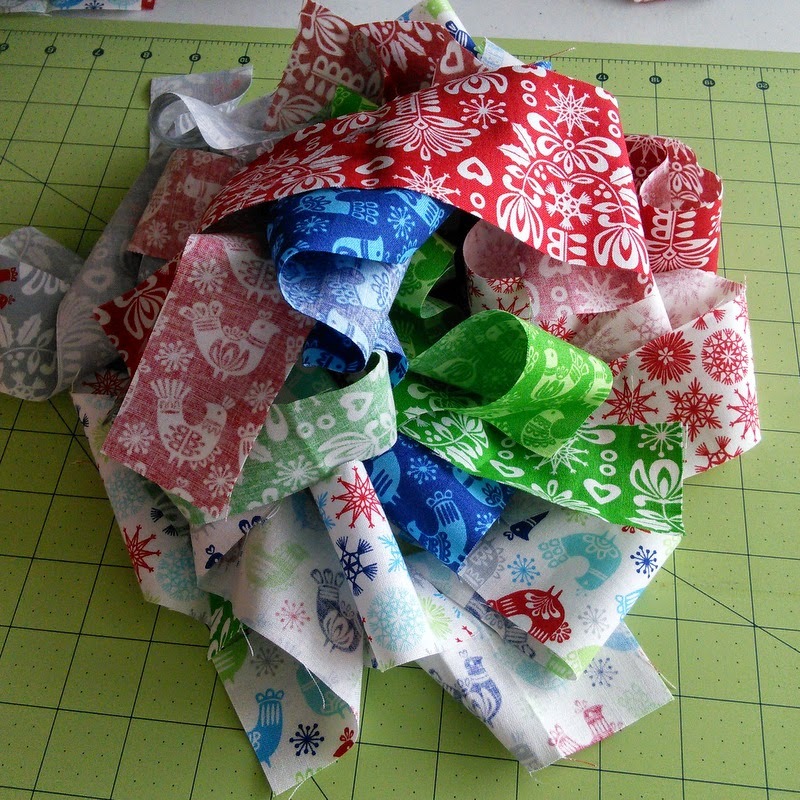 I started with a pretty pile of strips that I cut at all different widths, and turned them into some pretty awesome stockings. 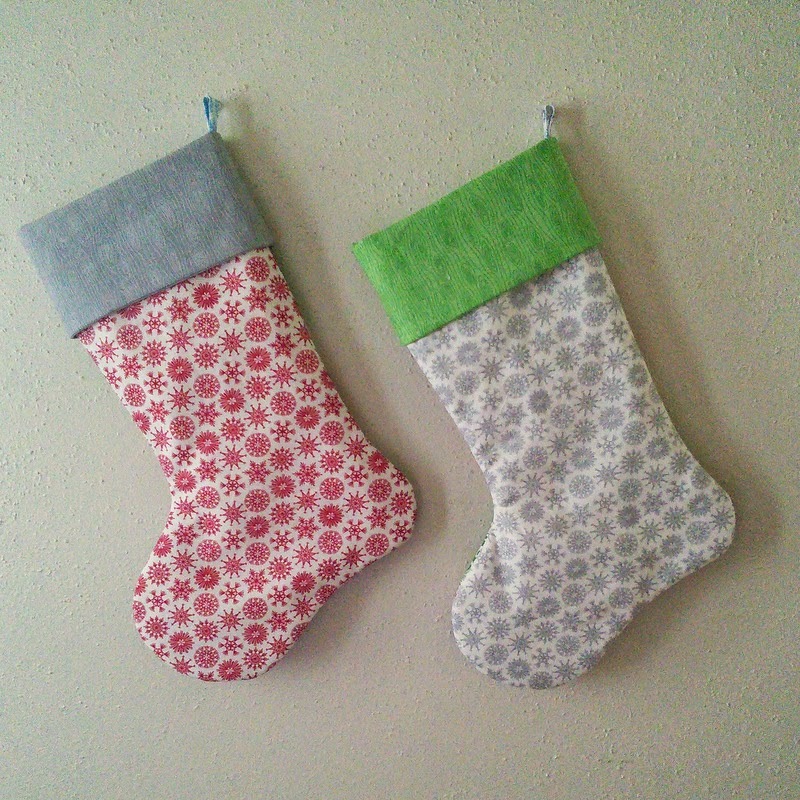 I have been wanting to make some matching stockings for myself and my 2 boys (the hubby and the baby) and I am so glad that I finally have! 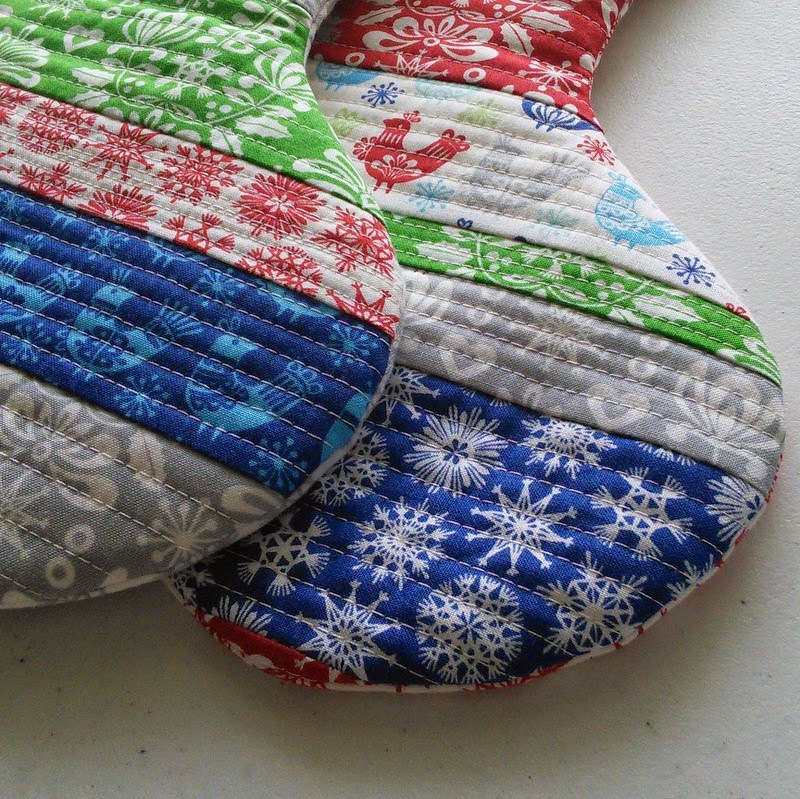 Well I've made stockings for Jeff and I, but I have plenty of strips left over to make 2 more. So William can have one, and mystery baby #2 that we're planning on having next year will have one too! I didn't use the wood grain for the QAYG portion of the stockings because I knew I wanted to use it for the cuffs. 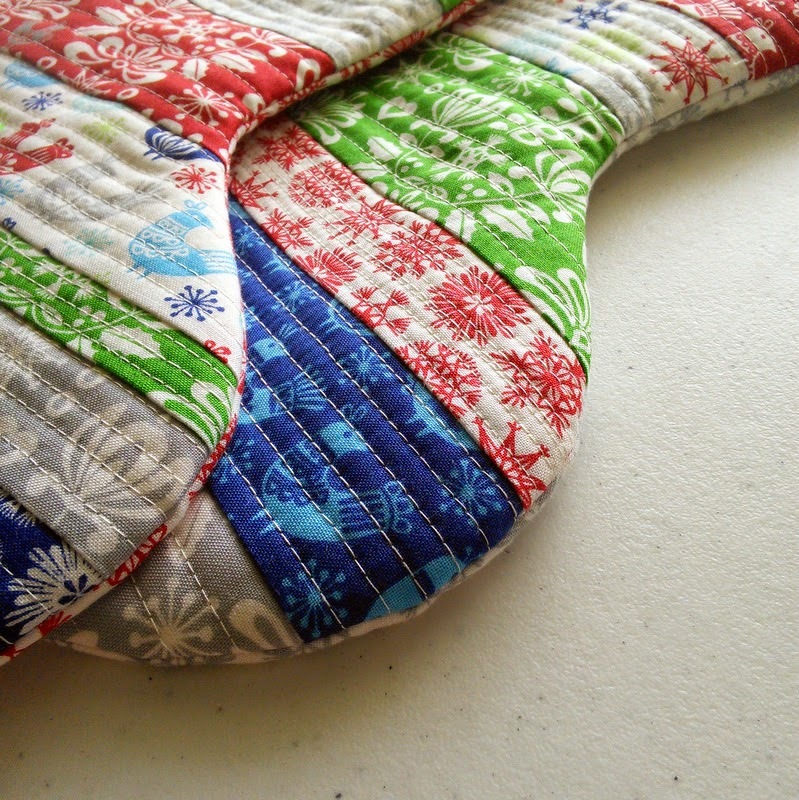 Since there are 4 different colors of the wood grain print, it's going to be perfect for 4 different stockings. I kept the back simple and used the snowflake print that coordinated with the cuff. I like to have a bunch of snowflakes and wintery themes in my Christmas decorating since we don't get many any snowy winters here in Houston, TX. 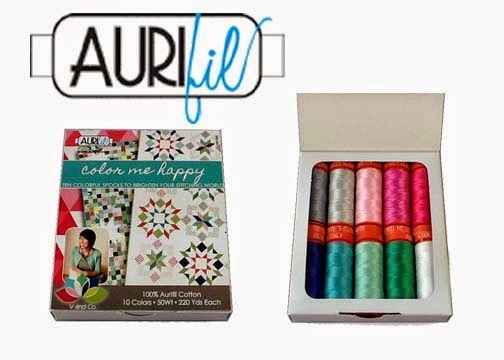 I used 50wt Aurifil #2311 for all of my straight stitch quilting. I absolutely love the color (or lack there of really) of that thread. It's a wonderful eggshell shade that blends really well with most fabrics. QAYG takes a bit of time, so not having to change thread colors between strips is a life saver. 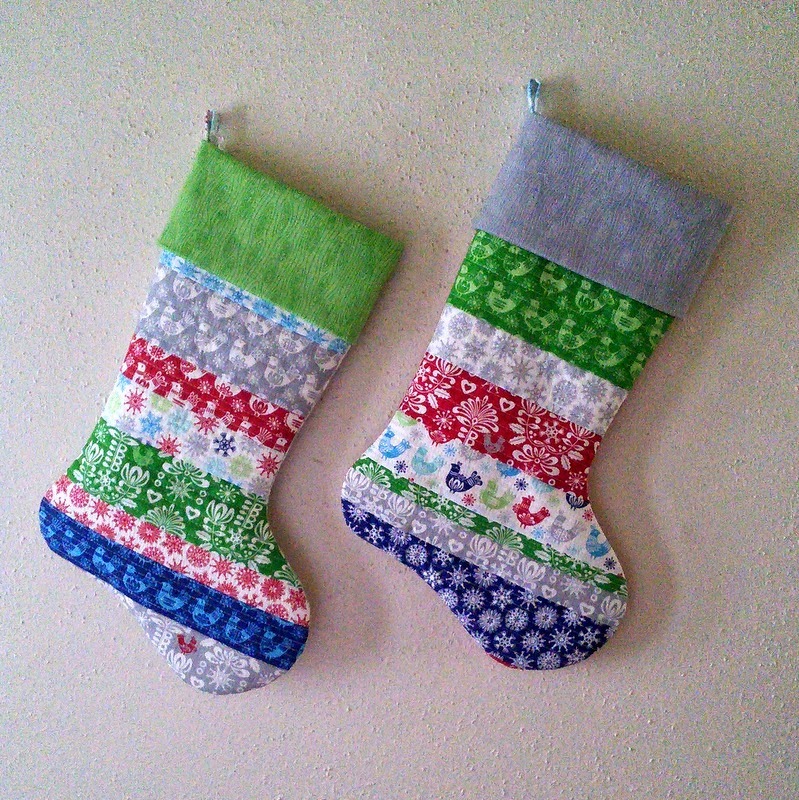 I can't wait to finish up the other two stockings, and then I have to patiently wait for Christmas decorations to hit the stores so I can get some cute stocking holders. This year will be our first Christmas with a fireplace to actually hang stockings on! I am quite excited because I love to decorate for Christmas. 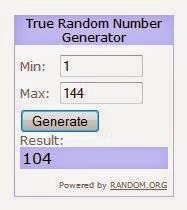 So after all my jabbering :) It is finally time for the giveaway!! 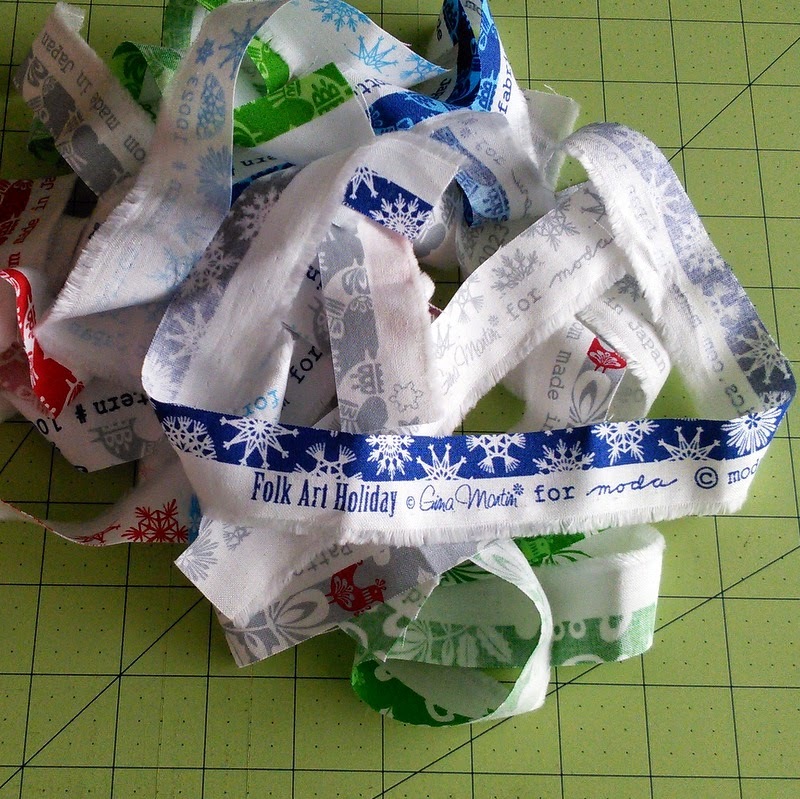 Gina has graciously offered up a Layer Cake of Folk Art Holiday for one of my lucky readers. 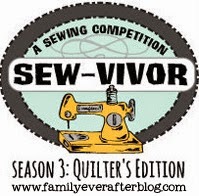 The giveaway will run from now until the end of the Blog Hop on July 31st. All you have to do to enter the giveaway is to leave a comment telling me your favorite holiday tradition. Mine is from when I was little and my siblings and I would always sleep in the same room on Christmas Eve, that way no one could sneak to see our presents in the middle of the night. Bonus Entry: My followers get an extra entry, Just leave an additional comment telling me how you follow me :) Facebook, Instagram, Bloglovin, GFC, etc. Thank you everyone for stopping by today, and I hope you liked the stockings I made! I'm looking forward to seeing what everyone else makes with this lovely fabric. Howdy everyone!! 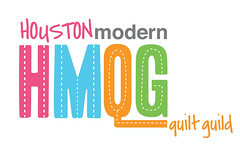 I am so glad you are stopping by on the Quilt Along today for my block for the great city of College Station. College Station isn't my hometown, but it holds a very special place in my heart for several reasons. I'm a proud member of the Fightin' Texas Aggie Class of 2011, I met the love of my life in College Station, and he and I had our little munchkin William there. College Station will always be my home away from home. "The City of College Station is a young municipality, with its beginnings in the founding of Texas A&M College. Texas' first state institution of higher education, the College was inaugurated in 1876. The campus became the focal point of community development. The area was designated "College Station, Texas" by the Postal Service in 1877. The name was derived from the train station located to the west of the campus. College Station has grown leaps and bounds since its humble beginnings, and now it is one of the top college towns in the country. 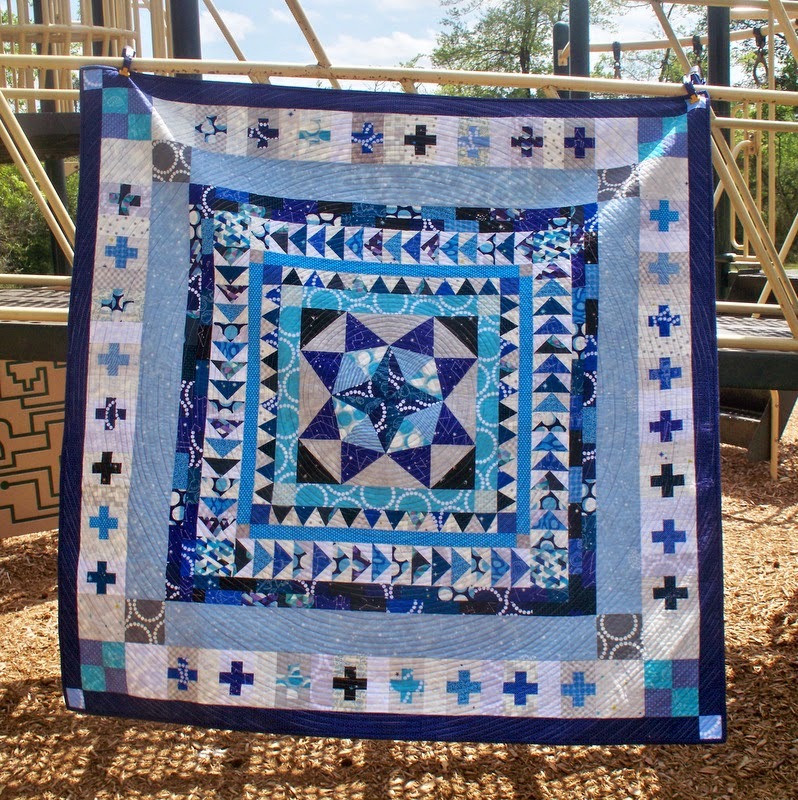 College Station is home to a great quilt shop called Lone Star Quiltworks. Terry (the owner) and the ladies there are always so friendly, and the shop boasts an impressive amount of fabric. There is a good blend of modern and traditional fabrics, and of course a HUGE selection of maroon and Aggie fabrics. The other local shop in town is Pruitt's Fabrics. They've been open since 1946 and they're located directly across from Kyle Field. Their fabric selection is a bit more modest, but they are the place to go if you need a custom game-day dress. I worked here during my sophomore year, and had a blast! After you work up an appetite fabric shopping, you're going to want to get lunch at one of the many fantastic restaurants CS has to offer. My personal choices are The Dixie Chicken, or Fuego Tortilla Grill. I spent many an evening playing dominoes & eating cheese fries and a burger at the Chicken with friends. And Fuego has AMAZING queso and tacos! You really can't go wrong with either choice. Since College Station has a relatively modest skyline, the one thing that always stands out the most to me is the Welcome to Aggieland water tower. I always feel an immediate sense of home when I see it on the horizon. So after going over and over what I wanted the block design for College Station to look like, (I almost did a Johnny Football block) I went with what felt right. The Aggieland Water Tower! Print the pattern for the water tower here. Print with no scaling. 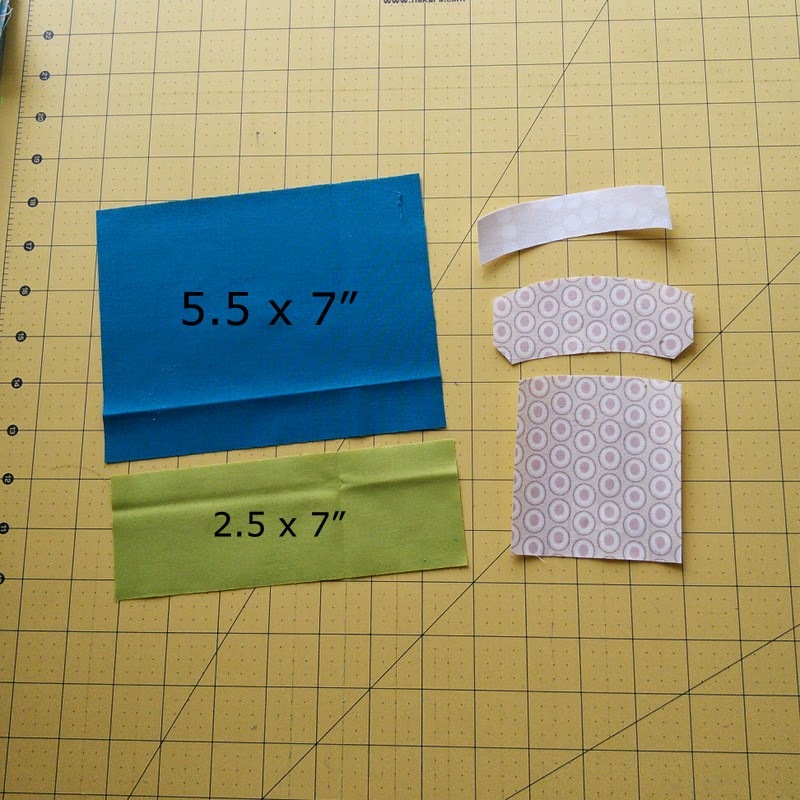 Your background pieces should be 2.5 x 7" and 5.5 x 7". 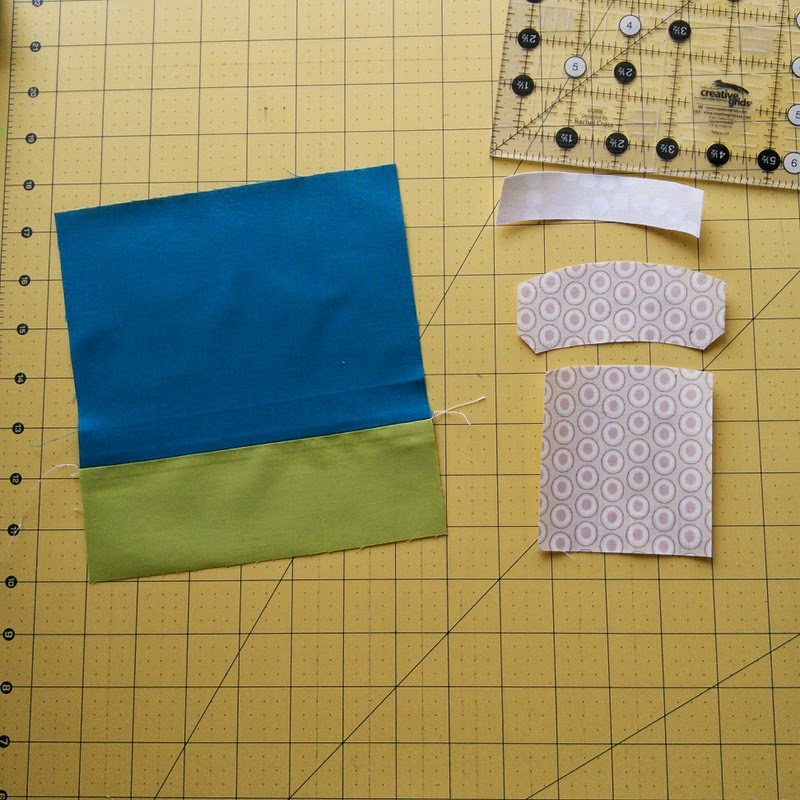 Sew background pieces together and press the seam as desired. I pressed mine open. 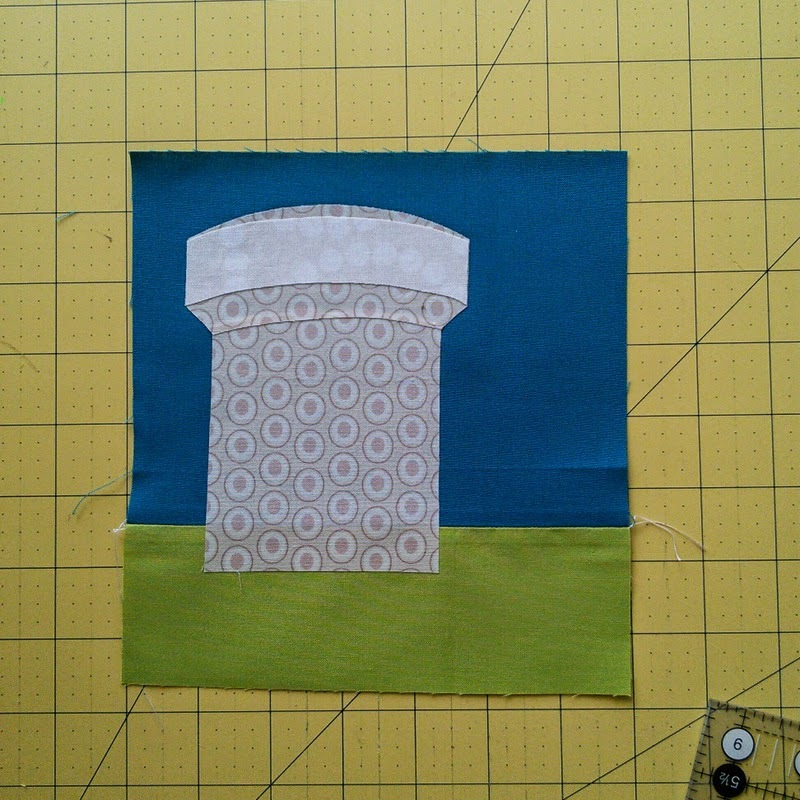 Fuse your water tower pieces onto the background piece. You can offset the water tower like I did, or you can center it. Stitch around the applique pieces as desired (I just did a straight stitch, but you can do a satin stitch or blanket stitch too). 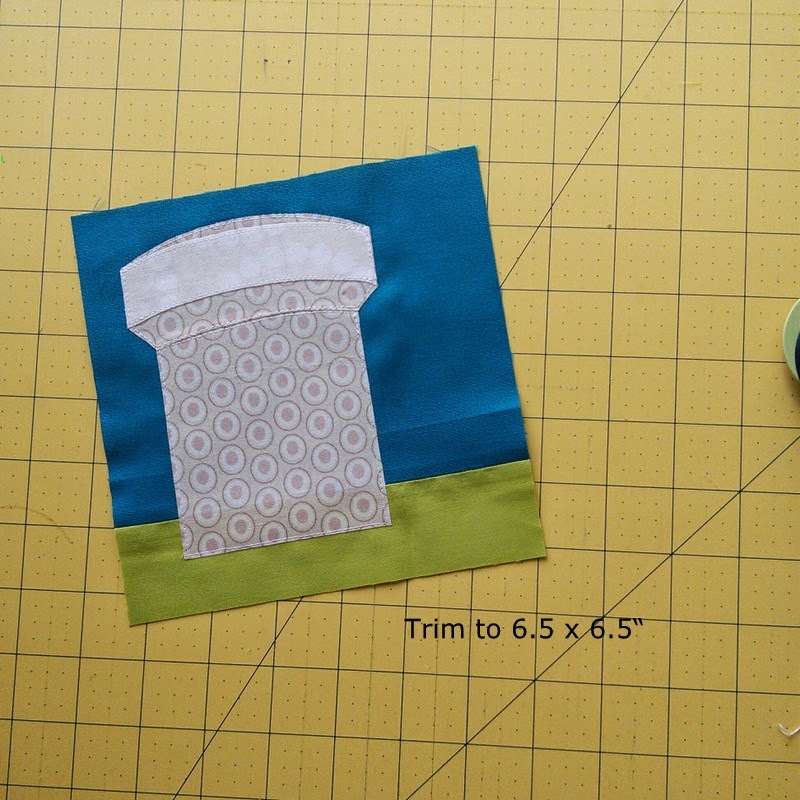 Trim the block down to 6.5" square. Be sure to leave at least 0.25" of an inch around all sides of the water tower so it doesn't get lost in your seam allowances. 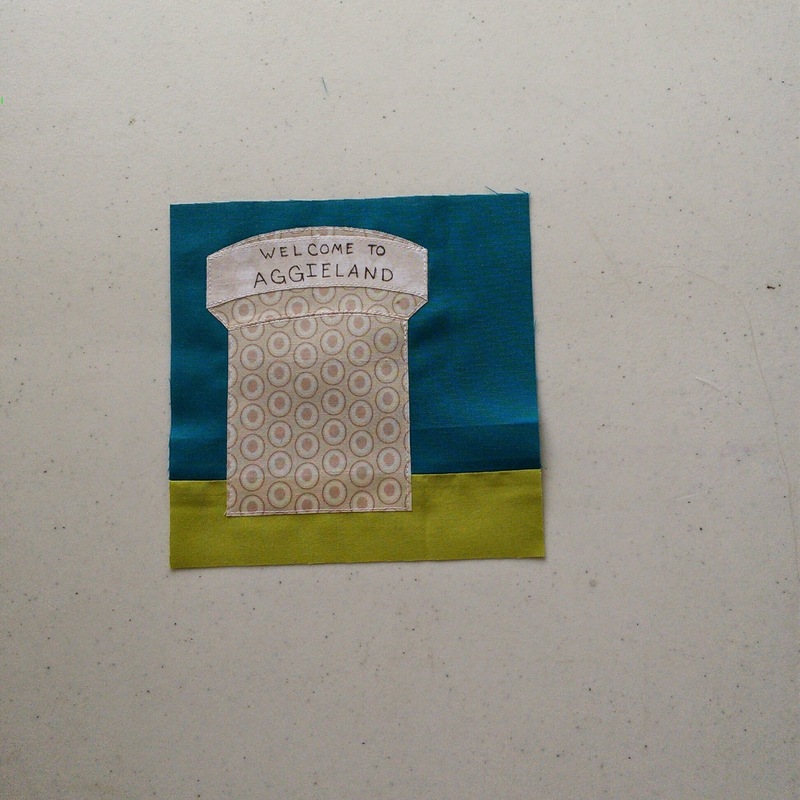 You can be done after the previous step, or you can do what I did and put "Welcome to Aggieland" on the water tower. I simply wrote it on with a gel pen that won't wash off, but you can embroider it on if you are feeling ambitious. 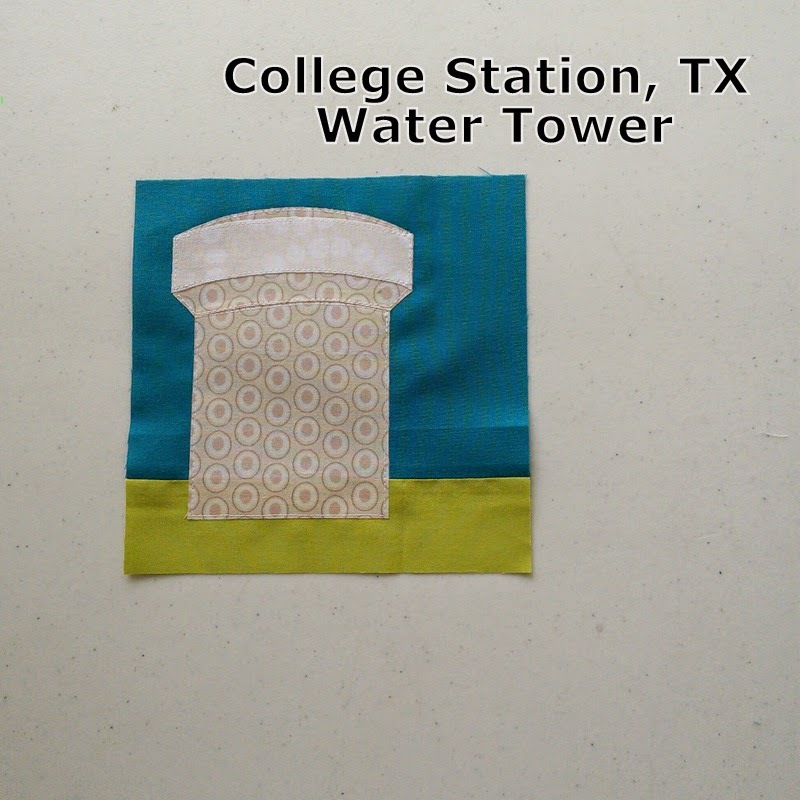 I can't wait to see everyone's water tower blocks on their quilts! And don't forget one of the most exciting parts of this post! 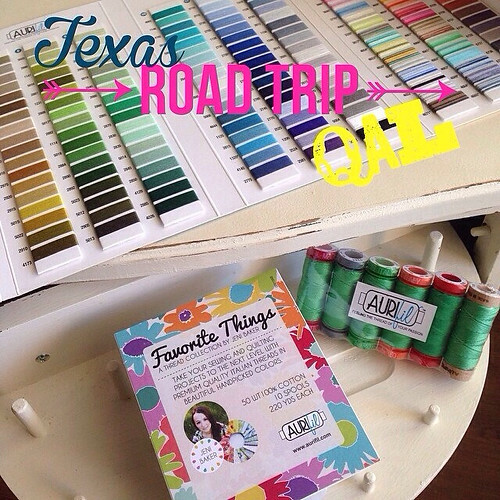 An amazing giveaway from Aurifil! All you have to do to enter is use the Rafflecopter widget below. The giveaway will run for 1 week, and I'll email the winner!